Asia For Jesus » Insha’Allah: Whatever! I met with some Army Rangers and SEALS today. They were pretty cool. You know how these military guys love to tell stories. They were talking about how many Muslim soldiers in Middle Eastern armies fight. They hold the gun up and just spray a bunch of bullets and shout “Insha’Allah”. What it means is that “whatever God wills, will happen”. So, in their understanding, all they have to do is just spray a bunch of bullets and God will allow it to hit whoever is supposed to be hit. It is a fatalistic perspective. The concept of Karma is much the same. If your rich, it is because in your past life you did something right and have good Karma, therefore your life will be easy. If you are impoverished, it is because you did something wrong and have bad karma. In effect, whatever happens to you is your own dumb fault. The Cambodian definition of Karma is: “Kluen pung ti kluen” (You can only depend on yourself). Once again it is quite fatalistic. This is one key reason why you will find thousands of Christian social organizations and relief groups, yet very few Muslim and Buddhist ones. So is this the perspective that Jesus lived and taught? Some people would have you think so. I have heard some Christians talk about faith like it has no need for work, action or anything. Simply living your life in a moral way would magically compel people to Christ. When I was in Seminary the doctrines of Calvinism were taking over the school. It would have been much more cool if Jesus had taken over the school! Some of them seem to teach that there is no need to share the gospel, because if God had “elected” them to become Christians then they would become Christian regardless anything you or anyone else does. 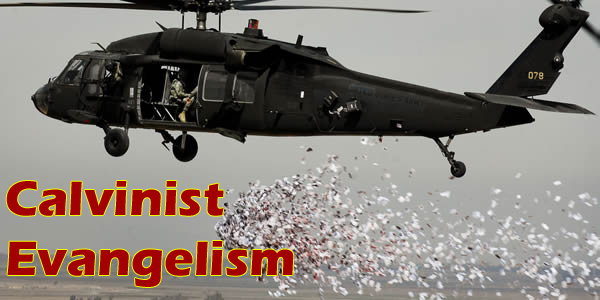 I can picture these guys idea of evangelism being like a helicopter dumping tracts out the aircraft and thinking that if God willed it, whoever the tract hit would supernaturally accept Christ. Was Jesus so fatalistic? Does our life really have no purpose, no need for vision, passion and drive? I am quite passionate about the red letters in our Bible, and also quite passionate about the black ones too. I know that Jesus has told us to love: Not only our neighbors, but our enemies. That involves action, not being passive. Basically, I think we can summarize Jesus’ marching orders to us as first, the Great Commandment, which says, “‘Love the Lord your God with all your heart and with all your soul and with all your mind.’﻿ This is the first and greatest commandment. And the second is like it: ‘Love your neighbor as yourself’” (Matthew 22:37-39). Secondly, the Great Commission, which says, “Therefore go and make disciples of all nations, baptizing them in ﻿the name of the Father and of the Son and of the Holy Spirit, and teaching them to obey everything I have commanded you. And surely I am with you always, to the very end of the age” (Matthew 28:19-20). These two commands from Jesus have several action words which include: love, go, make disciples, baptize, and teach. They are intentional, they are strategic, and they are filled with purpose. They are the exact opposite of fatalistic, or karma, or “insha’Allah”. There are dozens of other scriptures calling us to action as well. Matthew 10:8 says, “Heal the sick, raise the dead, cleanse those who have leprosy, drive out demons. Freely you have received, freely give.” This is the command that Jesus gave his disciples when he sent them to minister in the world. The whole Bible is filled with commands from our Lord to actively engage oppression, social injustice, sin, rebellion, sickness and demonic strongholds and to bring them into the righteous fold. This is not passive, this is active! We are not simply by-standers on the road of life, but we are tools in the hands of almighty God. God wants to use us as his instruments of change and transformation in the world. If we delegate our responsibility to some fatalistic doctrine of Karma or insha’Allah, then not only are we being a dis-service to our Lord Jesus, but we are irrelevant to his purposes and plan for all mankind. Jesus did not come to earth to make people feel better. He came to save us from sin and satan’s grasp. He called us, mere imperfect believers, to be his instruments of change on the earth. That requires action. That requires strategy. That requires seeking and accomplishing his will. That requires conquest. That probably will require offending many, many people with the truth of Jesus’ desire to bring them into his fold. Most of all, it is not “Insha’Allah” or “karma”, or a care-free attitude of “whatever happens, happens”. No, it is a compassionate resolution to accomplish his purpose and bring people to Jesus Christ no matter what the cost, and doing it God’s way.